The newest official GM trailer video teasing the 2014 Chevrolet Corvette is titled “CRAFT” and like the previous videos, we get a handful of tightly cropped shots that really don’t give us a look at the car but instead, they show us the new American supercar from angles that excites the imagination more than showing what to expect when the new C7 Corvette arrives. Sadly, this newest video shows us even less than those earlier videos and unlike those shots which show the 2014 Corvette in action – giving us a chance to hear the new LT1 V8 in action – this new video just shows a few tight shots of interior features. The most recognizable image is what looks to be the new leather headrest with contrasting stitching, which is shown above on the right. There are also some other shots of leather clad features with the white stitch work as well as some sharp looking carbon fiber pieces that I cannot identify. These interior features are all shown before the timer stirkes 3 seconds on the 42 second YouTube video…so you get an idea of just how little GM shows off in this video. 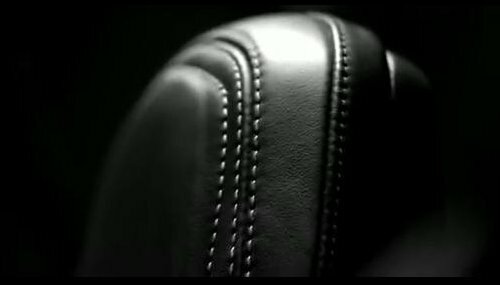 The next 40 or so seconds of the new 2014 Chevrolet Corvette interior teaser video shows us the production of the C7 interior as craftsman measure and cut the leather and assembly the seats. That being said, the video is edited in such a manner that the rest of the video doesn’t show any actual angles of the new Corvette’s interior. Ryan Vaughan, GM Performance Car Interior Design Manager explains the importance of the interior, as this is the portion of the vehicle that the driver and passenger experience the most closely when driving the car – stating that it “has to be perfect”. Like the other early teaser videos, this newest Chevy Corvette clip ends with a slogan – this time “Honor The Craft” – followed by a reminder that the next generation Corvette will debut on January 13th, 2013. Finally, before the video fades away to darkness we are once again given a look at the revised crossed flag logo that will adorn the nose of the new American supercar when it arrives next month. One area where the Chevrolet Corvette has always faced criticism in the global performance car market and here at home is the level of interior quality – one area where we can most certainly expect to see the 2014 C7 Corvette really stand out from the previous generations of the fabled American performance car. While the Corvette has always offered interior gadgetry, power features and leather surfaces, the American performance car frequently fell short compared to the European sports cars to which the Corvette is often compared with brands like Porsche and Jaguar. However, General Motors made a significant improvement during the C6 generation and when the 2014 Chevrolet Corvette arrives next January – we fully expect there to be a whole new level of fit, finish and luxury throughout the cockpit of the C7. Check out the third official company teaser below and stay tuned to TorqueNews.com for all of your breaking automotive news including continuing coverage of the slow tease of the 2014 Chevrolet Corvette!